I'm not entirely sure how I feel about knitted ties. J. Crew has had some for sale in the past few years (around $50!) If I were to ever want to give Keith a knit tie (IF), it would be cheaper to make one myself. Since I was curious about what free patterns are available, I initiated this search. I am limiting my search to classic looking neckties, not anything that can be tied around the neck. Traveling Rib Tie - Ribbed. Classic Shape. 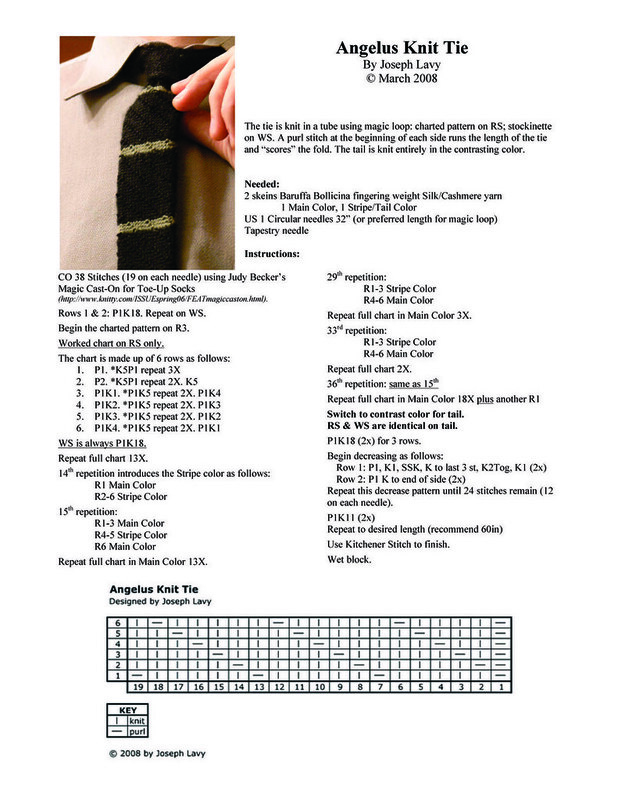 Angelus Knit Tie - This is double layered, but is not knit in the round. It is folded in a similar way you would see with a traditional tie. There is nice texture on this garment. Bias pearled stripes. A Silk Tie - Very classic tie shape with bias stripes. Knit Bow Tie - Just as it sounds! Men's Bias Knit Tie - very classic shape, diagonal stripes. Dad's Knit Tie - Straight, skinny. Bowtie Tie - This is not a bow tie. This is a tie that has a bow tie design on it. Classic shape. The first I've found with a color design other than stripes. Wool Bam Boo Striped Tie - stockinette with stripes. A pointed end (which looks like it was folded and sewn? I didn't open the pattern PDF to check). Skinny with a pointed end. Prep School - The small size fits a child. Knit with sock yarn. Classic shape. Tweedy Tie - Moss stitch, classic shape, point. His or Her Silk Necktie - Skinny, blunt ends. The Easiest Bow Tie Ever - Caroline would like this one a lot, as it is modeled on a baby! Unisex Skinny Tie - Multiple stitches cast on, knit width-wise. Chamber Tie - A cable down the center. Man's Tie in Party Ribbon - Garter stitch, pointed end. Hermione's Tie - Knit in Griffindor colors, cute eyelets in the center. Hogwarts House Tie - V-Shaped stripe, can be done in any of the house colors. Baby Necktie - So this is more for a young child than an infant, but it is a cute mini-tie that you can tie in the back with a strap. Add a paperclip to make it "clip on"
Retro Knit and Striped Tie - This one has a loop on the back so the back of the tie stays in place. Striped and Skinny. 1914 Gentleman's Knitted Tie - Spotted, classic shape from a vintage pattern. Cotton Tie - You need to scroll all the way to the right to see the pattern for this classic shaped tie. Patterns available for free on Ravelry (create a free account, every knitter should use that website! Garter Moss Necktie - This has a more traditional tie shape, with a fat end and a skinny end. Shetland Lace Jabot and Cuffs - Now this is a classic look. Very lacy. It had to be included. An Easter Tie - "Clip On" with elastic to keep this around your boy's neck. I do really like that one that's modeled on a baby! If you have to make a knitted tie, I recommend that one. But I don't vote for the regular ties! Stumbled across this page via Google while looking for knitted tie patterns. Thanks for a great compendium of links!